A pal told me to write from experience and well, I have a LOT of experience in this department. I started getting spots from the end of junior school and have been consistently for the last 10 years. I know I’m not alone, about 85% of young people suffer at some point and so as the majority of you know it’s a BUGGER! Before I go on, I do want you to know that it in NO way defines you, not even a little bit. You are still a beautiful person and I promise you no one is looking at that spot. We are always far more painfully aware of our flaws than anyone else is, so don’t point it out. If you point it out (oh im so spotty today, don’t look at my spot etc.) they will 100% notice, if you don’t – the odds are far better that they won’t. And even if they do! Who cares? Your skin generates more oil than their skin does. Your bum is probably fabulous or your eyebrows are on point or you can do maths or you have a really high score on fruit ninja! YOU HAVE LOADS OF GOOD BITS. Look for them and love them and so will the world. Disclaimer; this is what works on my skin right now and 10 years of trying stuff has lead me to this really simple list. I’d totally written off the generic clear skin brands (Clearasil, Garnier, Clean and clear etc.) due to various unsuccessful purchases in the past. I thought cheap product meant bad result and so forayed into the world of leading brands and big price tags. BUT. Recently I really needed a scrub and this was cheap and had the magic ingredient ‘salicylic acid’ which acts a shrinking agent for spots and a de-oiler. I was not disappointed! From the second day my skin was softer and looked more refined. I’ve noticed a slow improvement on those pesky scars spots leave in their wake, and I can honestly say my skin is better! If i use it at night, I can see a clear improvement by the morning. I now use at least once a day!! Get it from Boots for less than a fiver here! I’ve come to the conclusion that basic is better, and straightforward natural ingredients is best. At least twice a day I dab this little beauty on all my blemishes and it works. The Tea Tree extract is a natural antibacterial agent which fights the bacteria that clogs pores and causes spots, Witch Hazel calms skin making for a winning combination in the blemish battle. I use one from Boots, get it here for £2.59! Another cracking natural antibacterial ingredient, is Manuka honey! A very good friend put me on to this one, and I am forever grateful. As a mask, spreading it all over the problem areas and leaving it time to do it’s magic. Half an hour at minimum. Leaves spots diminished and skin mattified! As an overnighter, dabbing the teeniest bit ever on to spots and then applying your night cream (if you use) or spot treatment over the top to cover the stickiness and then going to the land of nod. It helps! Also mine has started crystallizing a bit which makes for a fabulous scrub! 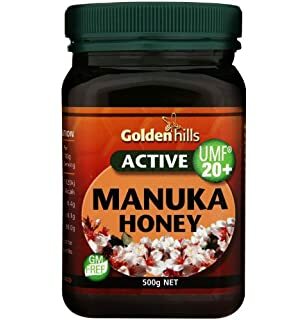 I use the Golden Hills honey pictured, but there are a million out there, go for the highest UMF (unique manuka factor) you can as that is where the magic is measured. You can get it from Supermarkets/Holland and Barrett/Amazon. I tried this as a last resort. Premature aging is nobody’s pal, I’ve been night cream-ing for years. But everyday when I woke up my skin would be so oily, and doubtlessly punctuated by a new blocked pore or two! So, I took the plunge and started just wearing eye cream* and the aforementioned blemish stick overnight, it’s made a big difference to my facey and my skin feels just as hydrated as ever just without the horrible oiliness from before! *Seriously eye cream is essential, get two. One with spf for the day, and anti-wrinkle for the night. Thank me when you’re 40. The difference in the oiliness of my skin if I go to bed by 10/11pm rather than 1am/2am is unbelievable. Oh and clean pillowcases. Refresh those bad-boys often!! It’s so simple, makes the biggest difference, benefits every aspect of your health and it’s free! Ideally not in your dinner though. At the end of the day just do your best. Take your make-up off at night and drink lots of water, and try not to focus on it too much. If you can’t change your complexion, change your mind set – it’ll make you happier I promise. Screw spots. Screw people who notice them. Screw caring. Previous postGOTR Aviemore Stopover – The Highlights. Next postSTA Travel Oz Talks! Another blob that is really readable and interesting. When’s the next one coming Though she be but wee?? ?